At Humanscale, we believe that the highest level of functionality is achieved through simplicity. With our chairs, we replace heavy, complex mechanisms with the sitter’s own body weight and the laws of physics to encourage movement, providing the most comfortable chair available. Our longstanding partnership with legendary designer Niels Diffrient produced our award-winning Freedom, Diffrient Smart, Diffrient World and Liberty chairs. We also collaborate with respected industrial designers such as Don Chadwick and Todd Bracher on new seating products. Niels' beliefs and values are embodied in his designs. As Humanscale shared these values with Niels, his legacy lives on through his products and our shared core beliefs. Find out more about Humanscale's partnership with designer Niels Diffrient. We develop our chairs without knobs and levers, so they’re incredibly easy to use. All of our chairs allow the user to change postures effortlessly without operating any manual controls. Designing chairs that are easy to use ensures that they are used in a correct, healthy way. 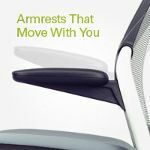 Most office chairs feature arms that are attached to the seat, which do not provide support when the user reclines or moves from posture to posture. Humanscale designs all of its chairs with the arms attached to the back, so when the sitter moves, the arms are in a healthy, ergonomic position every time. A soft seat cushion is often comfortable for a short period of time but uncomfortable when the user sits on it for many hours. Humanscale’s seat cushions are engineered to be denser than our competitors’ to offer all day comfort. We also pioneered the use of gel in seat cushions. Because gel doesn’t compress, it supports the sitter’s body and maximises comfort over many hours. Humanscale chairs are perfectly adjusted for every user, as if the chair was custom made for you. In lieu of traditional tension mechanisms, which can weigh as much as 6.8kg (15 lbs.) and be made of up to 40 parts, our task chairs use the laws of physics and the sitter’s own body weight. As a result, the chair automatically reads the weight of the user, allowing for the mechanism to provide perfect recline with the correct tension for every individual. Humanscale chairs are designed to look as good in ten years' time as they do today. Our textiles exceed 150,000 double rubs in the Wyzenbeek Test, which is five times the industry standard. Our textiles attach to the cushion without adhesives, which prevents wrinkling over time and is better for the environment. Our arm caps feature a separate foam insert, so they will not tear. Our plastics have a texture that prevent scratching. None of our chair surfaces are painted or treated, so there’s no chipping or scratching. We go to great lengths to ensure all the components of our chairs hold up to wear and tear, while maintaining a minimal visual aesthetic. We use fewer parts in our chairs to reduce the impact on the environment.